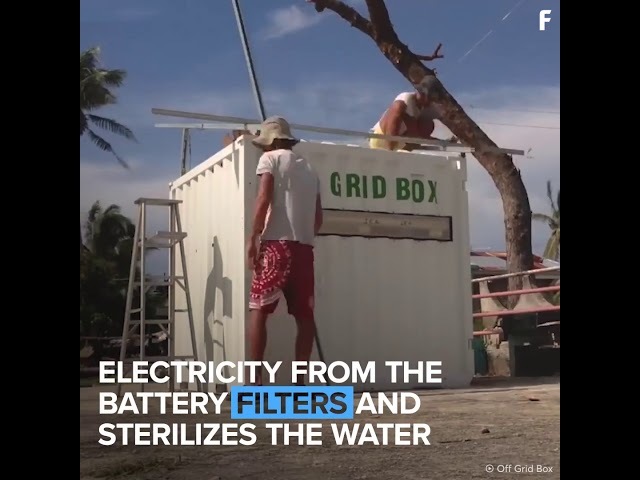 OffGridBox (Disaster Relief) provides renewable energy, clean water, and internet connectivity in disaster-prone areas. It is an environmentally friendly solution enabling NGOs and disaster agencies to create resilient cities—ensuring the safe delivery of drinking water in an emergency. Each Box, as disaster hub, may provide for 100-2,000 people with internet connectivity, electricity, and purified drinking water (from dirty freshwater or sea water). Additional add ons include 300 USB charging ports for mobile phones and computers. Already, 36 Boxes have been deployed in 9 different countries proving feasibility. Through local implementing partners (such as our NGO partner All Hands & Hearts), we teach how to maintain the system and prepare it (within minutes) in the case of a disaster. With this innovative technology, we see a truly resilient path to improve water infrastructure for the safe delivery of drinking water.